Every great garden needs a statement plant, and this is truly a Herculean addition. Add this blooming colossus to your borders and make a statement with Eremurus 'Rumba'. Fully hardy yet exotic-looking, the spires of amazing orange blooms are long-lasting and impressive. 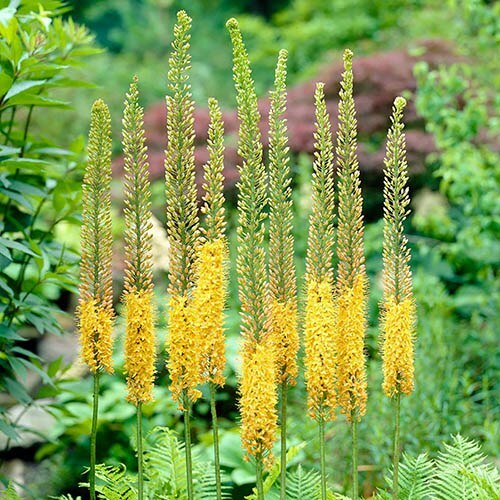 Make a colourful statement in your garden this year with the impressive Eremurus 'Rumba' a fully hardy yet exotic-looking perennial that will amaze everyone who sees it. The colossal flower spike of this relatively new variety is packed with orange blooms and make exceptional cut flowers. Also known as Desert Candles, the impressive flower spires are packed with star-shaped blooms, creating a bottlebrush effect. In June/July, the flowers open from the bottom of the spike upwards in a wave of subtle colour change that cannot be missed, and the tails often bend as they grow - looking even more like the jaunty tail of a fox. Rumba will put on a dazzling display like a giant sparkler as the blooms open up along its length from bottom to top, fizzing with colour. .Keep plants well-watered when in leaf. When dormant in summer they enjoy dry conditions.